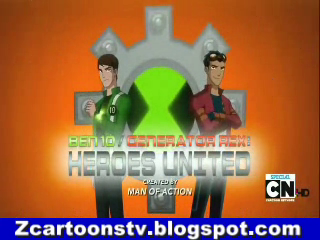 Now You Are Watching Ben 10-Generator Rex Crossover Heroes United in english.If You Have Any Kind OF Problem In Watching Video Then Comment Us.If You Like Our Website Then Share It With Your Friends. A mysterious rift begins to open in the skies of Manhattan. Meanwhile, former Agent of peacekeeping organization, "Providence", Rex Salazar is sparring against fellow agent, Agent Six, while musing about his need for a theme song, before getting the alert about the rift. Providence appears on the scene to stop the rift, but are unable to do anything before Rex arrives with Six and Bobo. Doctor Holiday, scientist and love interest of Agent Six, then gets a scan that shows something is coming through the rift, and Rex finds himself (unknowingly) fighting against Ben Tennyson, in the form of Humongousaur. During their skirmish, a strange metallic creature also appears and heads into the city, with Bobo and Six on its trail. Ben switches to Rath as Rex continues to try curing him; an annoyed Ben demands Rex stop as he doesn't even know what an EVO is. Changing back to human form, Ben is shocked that noone has heard of him despite being a celebrity. Then, Six appears with the creature, which self-destructs and renders him comatose, leaving Rex mortified and angered at Ben. At Rex's hideout, Ben is locked up in a containment unit, while Doctor Holiday explains that the creature was nanite in origin, but somehow completely different from an EVO. Ben offers help but is denied, and escapes into the night as Big Chill. Rex chases after Ben and both confronted by Caesar, who explains the creature's origin, saying that he created the creature (named "Alpha") as a means of manufacturing nanites that could adapt for any scientific need, but it became rogue as it developed sentience, forcing Caesar to banish it to another dimension. However, Ben reveals that that Caesar actually sent Alpha into the Null Void, a prison dimension for intergalactic criminals that the Plumbers capture. Alpha invades to absorb EVOs for their nanites, hoping to gain control of Rex's as it knows he holds the key to it obtaining perfection. Back at base Ben and Rex explain each other's origins, as White Knight reveals that Alpha has gone to the Bug Jar, which is full of EVOs for it to absorb. Rex, White Knight, and Ben arrive, only to find themselves against the nearly invincible Alpha, which begins to attack to take control of Rex's Omega Nanite. Ben fights as XLR8 and Fourarms. During the battle, Ben gains the form of Shocksquatch, but then temporarily loses his powers when Alpha copies the Ultimatrix and takes on Nanite powered versions of Heatblast, Fourarms, and Humungousaur. After a tough battle, Rex is able to disable Alpha's imitation Omnitrix powers, but is ensnared and robbed of his Omega Nanite, leading to Nanite Alpha to transform into a colossal being calling itself Alpha-Omega; the beginning and the end. As the now nearly unstoppable Alpha-Omega rampages, Rex has doubts about himself now that most of his builds are gone. Ben however comes up with a plan, and transforms into Upgrade and merges with Rex. The duo then take on the Alpha-Omega, weakening it enough for Rex to finally condense Alpha into a sphere of matter that weighs several tons. As Alpha was being condensed, Caesar appears and extracts the Omega Nanite. Attempting to dispose of Alpha, Caesar then opens a rift for Ben, who changes into Upchuck and devours the compacted Alpha as he heads back to his world. Rex returns to base, one last time, to find himself with a revived Agent Six. Caesar injects the Omega Nanite into Rex, as Alpha, now in the Null Void, begins to stir within its prison of matter, meaning its not over yet.